John Beilein, left, applauds his team. It wasn’t that long ago that Michigan’s basketball program was not merely unsuccessful, but the shame of the athletic department. Assistant Coach Steve Fisher filled in, and the team “shocked the world” by winning Michigan’s first-ever national title in basketball. But on the eve of Fisher’s ninth season, he too was fired in disgrace, because some players had been paid by a booster. Another assistant coach, Brian Ellerbe, was named the interim coach, which usually is a mistake -- and this proved no exception. At the 1998 Big Ten tournament, the Wolverines pulled a rabbit out of a hat to win it, and Ellerbe was named the permanent head coach – until he was fired three years later because of a bad record -- and players being paid by the same booster. The NCAA launched an investigation that lasted years. Tommy Amaker, the next coach, had to deal with the probation that followed. He never made the tournament, but he left Michigan’s program much better than he found it. The current coach, John Beilein, came to Michigan with a strong resume, having taken three different schools to the big dance, but not a high profile. Beilein is the eighth of nine children, all of whom had to find their own way to college. For Beilein, basketball was the ticket. After he graduated from Wheeling College, he took a job back home in sanitation. He was working in a sewer, knee deep in you-know-what, when his father’s face appeared in the manhole above. He asked John if he wanted a job at the local high school. Basketball announcers love to mention that Beilein has never been an assistant coach – which sounds cool, because they don’t tell you where he was a head coach. How about Newfane Central High School, Erie Community College, Nazareth College, Le Moyne College, then finally Division I: Canisius, Richmond, West Virginia, and Michigan. When your team is filled with short guys, as his usually were, how do you beat the big boys? You outwork them, you out-think them, you out-pass them, and you hope you outshoot them. I’ve been even more impressed by Beilein off the court. In his second season at Michigan, with his team on the verge of their first NCAA tournament in 11 years, they went to Iowa for a crucial game. Going into overtime, his star, Manny Harris, started sulking - so Beilein benched him. They lost, which meant they had to beat 16th-ranked Purdue – and they did. That same year, the men’s basketball team achieved the most improved grade-point-average of Michigan’s 25 varsity squads. Nonetheless, when Michigan failed to make the tournament the next year, many fickle fans were calling for his head. Good thing they didn’t get it. Beilein’s teams have made the tournament three straight years, won Michigan’s first Big Ten title since 1986 last year, and got to the championship game on Monday, for the first time in two decades. They came up short, but the vast majority of Michigan fans seem less upset than proud -- of what they did, and how they did it. 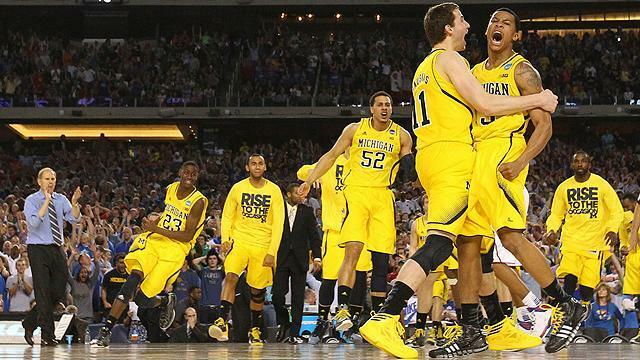 The Michigan basketball program has not been this healthy since -- well, ever. After firing the last four coaches, three surrounded by scandals, Michigan just might have gotten the right guy. He just took a little while to get there. An impressive run through the NCAA tournament came up short for the Michigan Wolverines last night in Atlanta. After running up a double digit lead in the first half, the Wolverines succumbed to Louisville’s pressure defense. The Cardinals kept up their hot shooting on offense and did just enough to put away Michigan down the stretch. 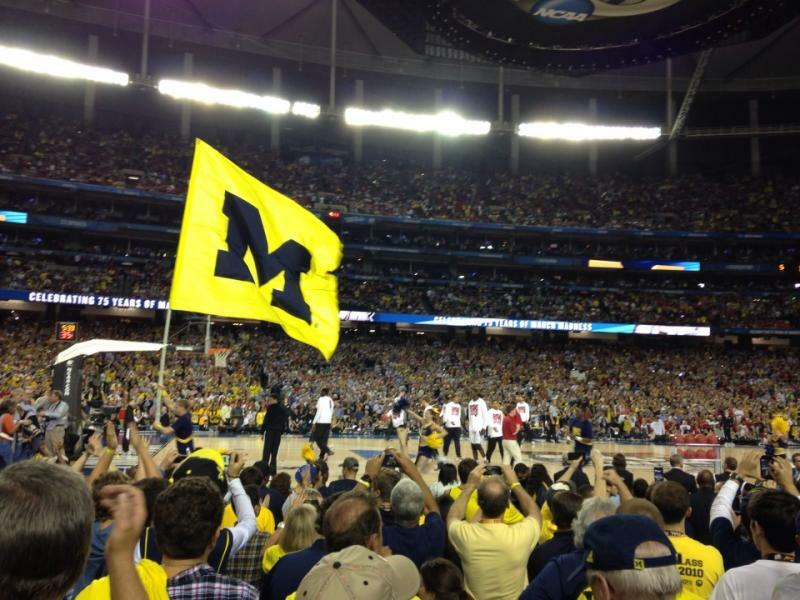 The final score: Louisville 82-Michigan 76. The Wolverines did have some standout performances. AP player of the year Guard Trey Burke had 24 points for Michigan (31-8). Little-used freshman Spike Albrecht added 17 points.